C.C.Y.C. 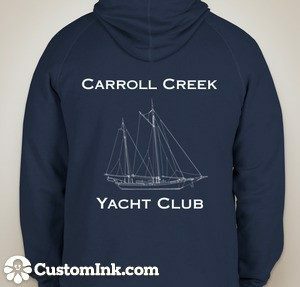 – Carroll Creek Yacht Club Limited Edition Sweatshirts Available Now! Ahoy and welcome to the auspicious “Carroll Creek Yacht Club!” Following the successful build and maiden voyage of the “Stargazer”, we are looking to expand the fleet this year and your support is greatly appreciated. 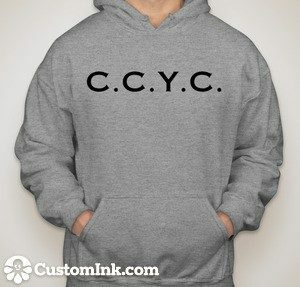 C.C.Y.C sweatshirts are available for a limited time, in a limited quantity, so order soon. The sweatshirt types are not identical – The Navy blue sweatshirts are more light weight, while the Grey sweatshirts are a heavier weight. Links are provided below to the three versions of our hooded sweatshirt. 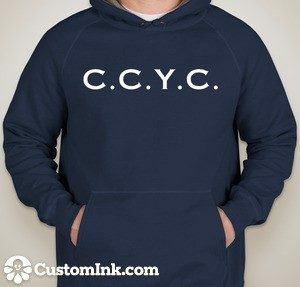 A Navy Blue sweatshirt with white graphics and lettering, as shown above, available in sizes Small to 2XL. A Grey sweatshirt with black graphics and lettering, as shown above, available in sizes Youth Extra Small to 5XL. And finally, the Christmas spirit shines through on our Navy sweatshirt, white lettering with Christmas Lights design! (as shown to the left). This one is also available in sizes Small to 2XL. Note: This sweatshirt will only be created if we get 20 orders. Pricing varies and is listed on the pages included in the links above. This initial group order will be placed on January 25th and it takes about 14 days to create and ship. They will ship in one bulk order. 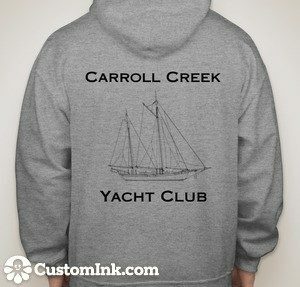 We will distribute the sweatshirts individually to yacht club members. Items can be collected or will be delivered by either Pete Kremers or Kyle Thomas. Thank you for supporting Color on the Creek and welcome to the Carroll Creek Yacht Club!! All proceeds from sweatshirt sales will help fund Color on the Creek and “Sailing Through the Winter Solstice.” For now, we are starting with one group order. Additional orders can be arranged in the future based on group interest or by contacting Kyle directly at kylenathanthomas@gmail.com. Based on popularity, we may be expanding merchandise sales to t-shirts, hats, and other items. C.C.Y.C design, logo and concept, created by Kyle Thomas.